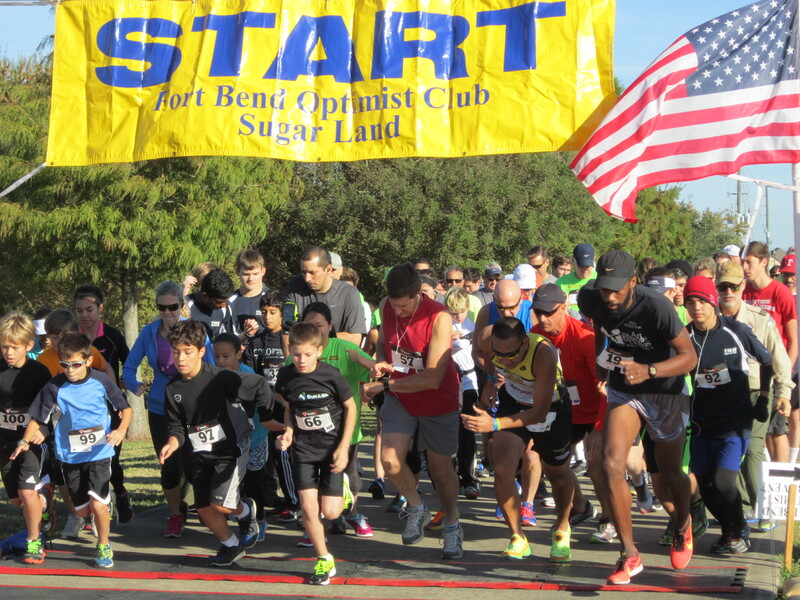 The Fort Bend Optimist Club Sugar Land held its 32ndAnnual Fun Run / Walk on November 2, 2014. Over $22,000 was raised in Sponsor support and Runner / Walker Registrations. Over $8,000 in merchandise and services were donated by our Sponsors and Supporters and were given away in a drawing and Silent Auction at the end of the race. The proceeds go to fund various youth related projects in Fort Bend County. The largest project is the College Scholarship Program in which we give to a graduating senior in each of the High Schools $1,000 payable to the University/College they are planning on attending. One Hundred Fifty (150) registered for the event this year. Please join us next year – and check out our Facebook page here for photos and updates. Trophies given for overall winner, 1st, 2nd and 3rd place in each age group in the 5K Run. All registrants eligible for drawings with multiple winners of gift certificates, dining and fast food meals, golf, tennis, massages, and other merchant donated amenities. Sugar Land Memorial Park/Pavilion is located along the Brazos River between US59 and University Blvd. The Park entry and pavilion for registration is located near the intersection on University Blvd. and Commonwealth. 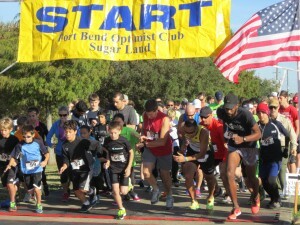 The 5 kilometer race will be on a level course from the Pavilion to the UH Sugar Land campus and back to the Pavilion. Click here for park information. The park provides ample free parking and restrooms are available on-site. The annual Fun Run/Walk is the primary fundraiser for our Youth Scholarship Program, and many other “Friends of Youth” programs FBOC has provided to the local community for more than 30 years. The Optimists award a scholarship to every area high school in FBISD. In addition, FBOC has a Student Appreciation banquet, oratorical and essay contests, sponsors a Boy Scout troop, and much more. The Optimists have enjoyed the support of local merchants, professionals and citizens in our community.